To catch up with the earlier parts of my journey, click here. Irkutsk is perhaps one of the most popular stops on the Trans-Siberian railway, as it’s the closest gateway to the spectacular Lake Baikal – the world’s largest freshwater lake. Sadly, for the first time in my travels I was starting to feel a little pushed for time. I hadn’t anticipated a full month in the Philippines as well as a week in Mongolia, so by the time I got to Russia I didn’t quite have as much time as I’d thought I would have. As a result, I didn’t manage to get to the supposedly majestical Olkhon Island – which is apparently a ‘must see’ place around Lake Baikal. I had considered going there for a few nights, but the fact it was seven hours or so each way from Irkutsk would mean having to go straight through to Moscow from Irkutsk: an unthinkable four or five days on a train! I decided to compromise and see Lake Baikal from the closer point of Listvyanka – a small village around 70 kilometres from Irkutsk. Granted, it wasn’t quite Olkhon Island, but it could be done in a day, driven to in an hour and only cost 120 rubles each way (around £1.20!) from the city centre. A lake is a lake…right? 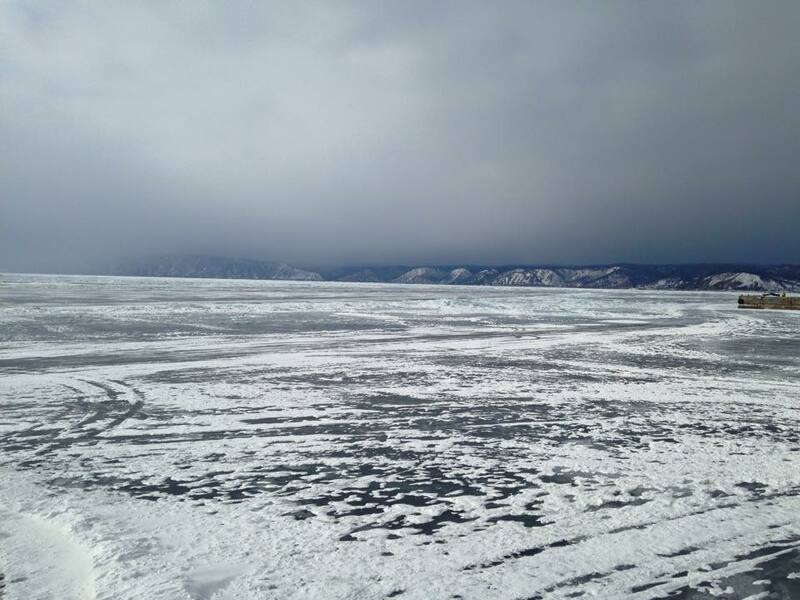 Lake Baikal from Listvyanka: stunning! I arrived in Listvyanka just after midday and noticed a couple of things; namely that it was much colder at the coast than in the city, and that it was snowing fairly heavily which was made much worse by the wind. These realisations, coupled with the fact I’d left my gloves in Irkutsk, meant that my first priority was to get some food and a coffee. One thing that was incredibly clear in Listvyanka was the fact that it was low season. Whilst the village looked like it could be a very popular tourist spot in the busier months, in the middle of February it resembled a ghost town and finding an open cafe was a little harder than I’d anticipated. In the end, I settled for the delicious local speciality of ‘omul’ – smoked fish to you and I – from the local market and set off on a walk along the coast road. I set myself the target of reaching the Baikal museum, which was a fairly sizeable walk from the bus stop in the village. At this time of the year, the lake was frozen absolutely solid which meant activities on the lake were somewhat limited to rides along the frozen lake and not a great deal else. I had toyed with the idea of doing a husky sledding tour, but five kilometres of holding on to a rope in those temperatures with no gloves really didn’t appeal. Call me soft, but my hands changed colour just eating my omul so I dread to think what might have happened there! 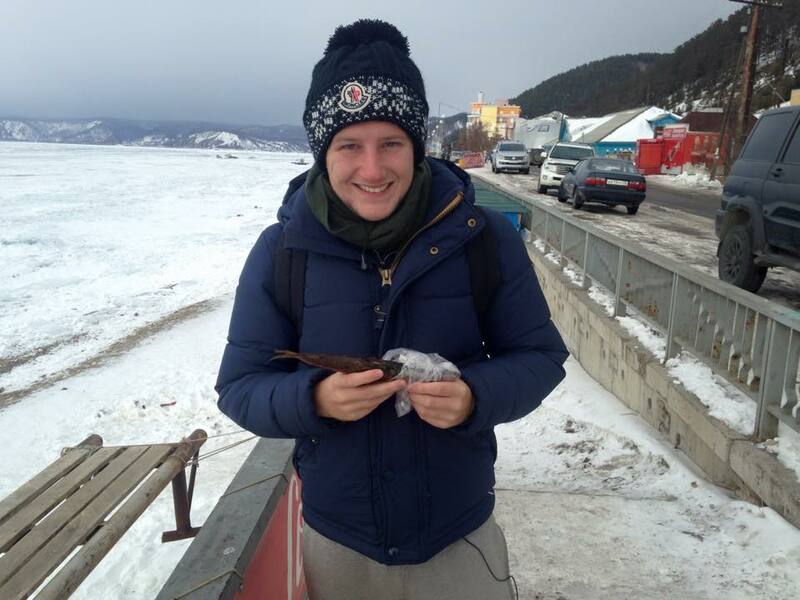 Me, Lake Baikal, and a smoked fish. I finally reached the museum and paid 250 rubles in. I’d heard the museum was really informative about the history and the geography of the lake, so I thought it’d be a good idea to warm up and broaden my knowledge. Now I’m not too sure what I was expecting but, seeing as the museum was recommended in the English language Lonely Planet guide, I think I probably expected at least some of the museum exhibits to be in English. Sadly, it was 99% cyrillic apart from the odd name here and there; it was a short visit and I spent most of my time in the aquarium section trying to get a photo of one of the seals. I struggled. I slowly strolled back to the bus stop and made my way back to Irkutsk. I’d recommend Listvyanka for anyone who wants to see Lake Baikal but doesn’t have the time to head over to Olkhon Island. Maybe just brush up on your cyrillic if you want to visit the museum! This was the leg of my Trans-Siberian journey that caused me the most hassle when planning. Between Irkutsk and Moscow there is plenty to see – but I’d not been told of anything that was absolutely essential. With time ticking away, I had decided that it would be better to make a rather large dint in the journey to Moscow on this leg and spend a night of two somewhere on the way. Yekaterinburg seemed a logical choice for a few reasons; it’s a large city with a historical element and it was rather close to Moscow. Now, by ‘close’ I do mean close to Moscow in Russian terms. It’s still probably over a day on a train away from the capital but, when you consider the sheer size of Russia, that is actually quite close. Besides, this journey would be a whopping 48 hours – what’s another 24 a few days later? Again, my incredibly basic grasp of the Russian language and non-existent knowledge of cyrillic came back to bite me when I went to buy my ticket the day before the journey. I’d had the lady from my hostel write down exactly what I needed, only for the lady at the train station to laugh, hand it back to me, say something in Russian and turn away. Imagine my confusion! I stood there for a minute wondering what the bloody hell to do before deciding to go back to the hostel and check online to see if the train was still running. Apparently it was, and I could buy a ticket through the English language version of the Russian Railways website – a life changing revelation! Not only do I not have to stand staring in confusion when I’m inevitably faced with questions I don’t understand, but I can also buy them in comfort for the prices I’d pay at the station instead of the usual online agency booking fees. In fact, I saved around £80 on this journey alone! 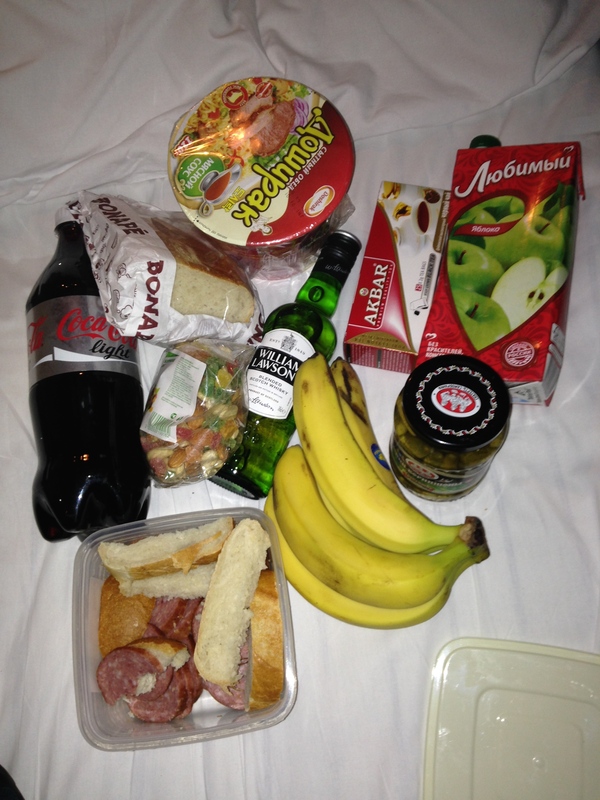 48 hours on a train calls for provisions. Despite finding the 3rd class carriage more than comfortable enough on my previous journey, for this two day slog I decided to upgrade back to my usual 2nd class hard sleeper compartment. Within minutes of getting on the train I thought this may have been a bad idea, as a woman came in to my compartment who I knew I wasn’t going to get along with. Him: This is your bag? What was I supposed to say to that?! There were more places for my bag to go, but I don’t think that’s really the point. I couldn’t be bothered arguing though, and he was considerably larger than me so I let him win that one. My poor bag in its new resting place! So me and this lady didn’t get off to the smoothest of starts. It only got worse when she opened her mouth; she had the most irritating voice I have heard in a very long time. It sounded so full of self-pity, like she had the hardest life in the world. Everything she said sounded like she was just telling some sort of ‘woe is me’ tale. Now as you know, I don’t speak Russian, so as far as I’m aware she actually could have been the happiest person alive and was just unfortunate enough to have been blessed with this incredibly irritating voice. I doubt it though. The final straw though – the deal sealer in this whole episode – came not long after the train had set off. She was on the bottom bunk, whilst I was sprawled out on the bed above her. She suddenly bolted out of her bed and barked something at me in Russian. My response was ‘je ne govorju po Russki’ – I don’t speak Russian. What followed was one of the most bizarre things I have ever witnessed. Instead of gesturing to indicate what she wanted, this woman – who, bear in mind, I had only met 20 minutes prior to this – put her hand in my face and palmed it towards the wall. I often find a handshake is a good way to introduce yourself to a stranger, but this wench went straight for a palm to the face. Things took a very surreal turn just seconds later when she appeared to be taking her trousers off and then it clicked; she wanted me to look away whilst she got changed! She could quite easily have just pointed to the door instead of sticking her grubby hand in my unsuspecting face, but each to their own. To put it bluntly: I hated this woman. After a while, I was getting so wound up hearing her voice through my headphones that I had to leave the room. I went to the restaurant cart and – despite not being hungry – grabbed a menu. It was at this point I realised that I hadn’t actually had a beer since arriving in Russia; what better time to sample the local brew than this? I figured I had 48 hours to kill and, since I didn’t know which were the best beers, decided to work my way down the menu sampling every beer I’d never heard of. 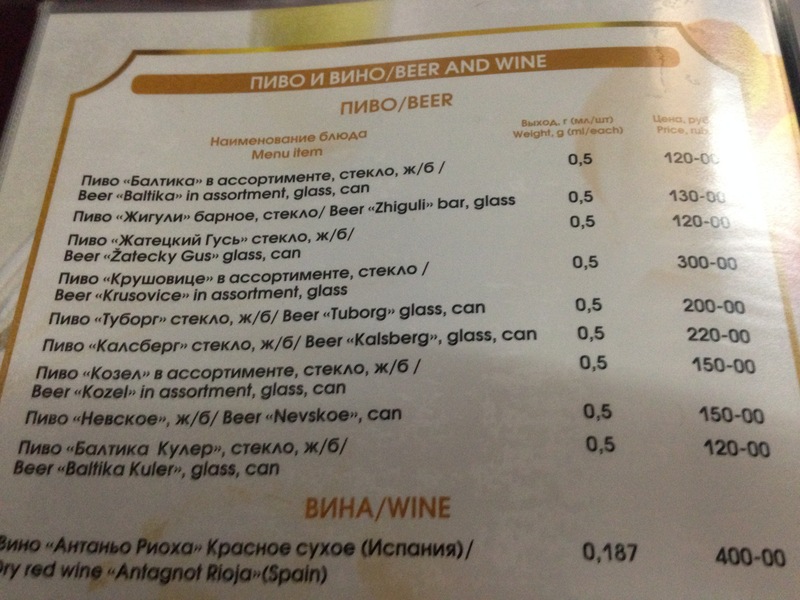 Sadly, despite listing around six new beers for me to try my options were limited to two: Baltika and Zighuli. After sampling both, I decided to crack on with a few more Zighulis and headed back to the room some hours later. As soon as I stood up, it became clear that I really hadn’t eaten enough that day – just a bowl of borsch in fact – and I was feeling pretty sloshed off four beers. For some reason I decided that instead of getting food, the most sensible move was to drink more alcohol so I cracked on with the bottle of whisky I’d taken on to the train and shared it with Alexander – a 67 year old Russian bloke in my compartment. I’ve said it before and I’ll say it again: I have no idea why I get myself in to these situations. We saw off the large majority of the bottle whilst sharing stories in broken English (his English was basic, mine was drunk) about our lives and so on. I’d like to tell you all about Alexander, but I really don’t remember much. I went to bed and passed out pretty much instantly. I’m almost certain I will have got my revenge on the woman below as not only am I a drunken snorer, but I also had a beast of a cold at the time. Snore city. The next day was spent mostly watching movies, reading books and sleeping. Having a hangover on a sleeper train is great as there aren’t many places to spend your days other than in bed anyway, so you don’t really feel all that lazy. A few leg stretches at the longer stations were a nice way to clear my head and get some fresh air before normal service was resumed. Besides the hangover, one of the hardest aspects of this journey was the time changes. 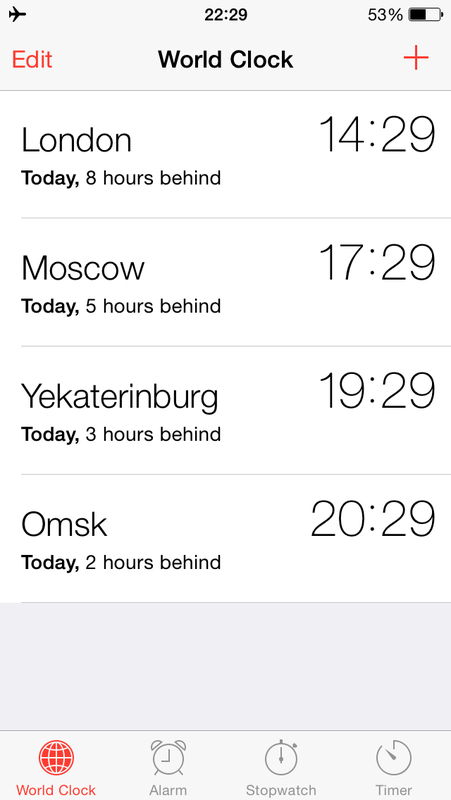 Russia is so big that it actually has nine different time zones throughout the country. When on a long distance train such as this one, it’s almost impossible to actually know what time it is as you’re passing through so many different zones. I often had no idea what time it was. For this reason, all train times are given in Moscow time. So despite leaving Irkutsk at 4.15pm, according to the train company our train actually departed at 11.15am. It makes total sense to do it this way – but it didn’t half get confusing on the second day! Thankfully however, I got off at the right time in Yekaterinburg exactly 48 hours after departing Irkutsk; 11.15am Moscow time and 1.15pm local time. 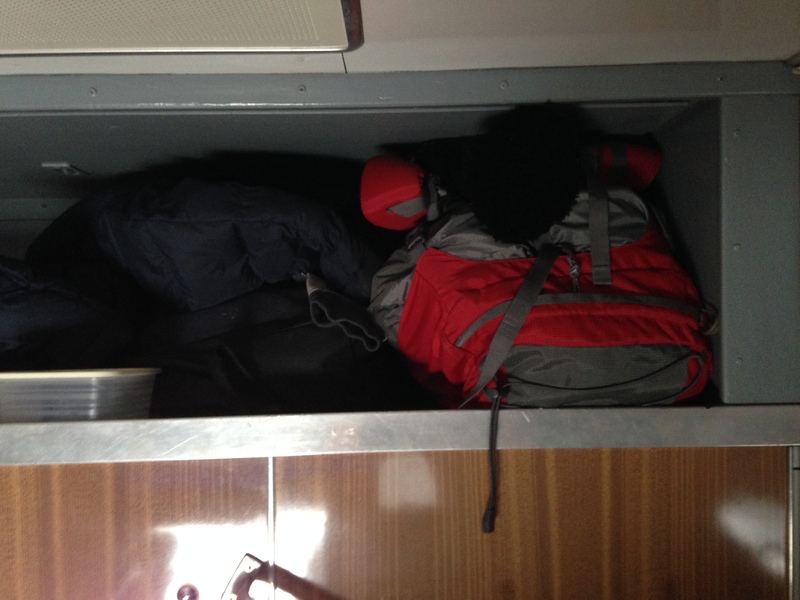 Two days on a train really hadn’t been all that bad – despite ‘you know who’ below me and the hangover. On the plus side: every journey after it would surely feel like a walk in the park – easy peasy! Click here for part five of my journey: Yekaterinburg to Kazan! Hilarious post. I laughed out loud at the face palm ‘introduction’! 🙂 May I ask what you thought the terrain was like on your journey (or did you really sleep through most of it)? Im doing the trans mongolian, and I’m trying to decide whether I should just fly from Yekaterinburg to Irkutsk as i was told my journey would take 54 hours! You must have had a really good train if it only took 48hrs?? To be honest, I didn’t find the terrain bad at all. Not the smoothest, but I still got plenty of sleep over the nights and throughout the day. The time seemed to pass quite quickly, actually. Obviously a good book, a few movies and random interactions (that didn’t involve a palm to the fact!) helped that. What I will say is that Yekaterinburg should only be a short stopover. I did just over 24 hours there and it was more than enough! Just a convenient place to break up that mega stretch in the middle really. To be perfectly honest nothing particularly stood out to me! Once you’ve gone past Lake Baikal in the earlier trip to Irkutsk, this leg is more of a formality than an essential part of the trip. If you were to skip it you really wouldn’t miss all that much! Where are you stopping off? It’s certainly an interesting experience, I’d go as far as to say it’s one of the best things I’ve ever done! Wow, that’s some statement! There’s nothing like traveling to make you feel like you’re doing something right though 😉 Love it myself. I’m starting in Moscow, then stopping in Kazan, Yekaterinburg, Irkutsk (Olkon island), Ulan Ude, Ulan Bator, Beijing and Shangai. I’ve 17 days to do Moscow to Beijing, and I’m finding it’s not actually much time. So wondered if I should save time by cutting short this part of the trip. It certainly feels like a ‘formality’ and possibly worth foregoing…and I might. Thanks for the honesty! Where you for next?? Yeah if time is limited I’d say fly it! My biggest piece of advice would be to spend as much time in Mongolia as you can! Ulan Bator can be done in half a day, but if you stay at a good hostel (I stayed at Sunpath) they can organise short tours into the countryside where you stay with nomadic families in the middle of nowhere – it was amazing! As for the rest of your trip, Moscow is awesome. Kazan is beautiful but I only did half a day there (it felt like enough), Irkutsk was fun but I didn’t make it to Olkon, just did Listvyanka for a day, Ulan Ude wasn’t bad…just a place to break up the journey to be honest. As for me, I’m leaving Japan at the end of my contract in August after two years. Back to the U.K. for about 6 weeks then I’m thinking of heading out to Taiwan to teach. Loved my holiday there over Xmas and New Year! When do you start your trip? You should be fine! We opted for the 4 night 5 day tour, but I’m fairly sure there were shorter ones available. I’d say it seems quite authentic in that they didn’t pull out all the stops so to speak aside from a few little things, the families tended to get on with their day to day stuff and let you join them. Really, really fun!